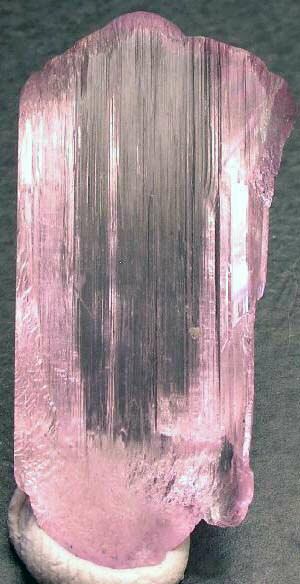 Kunzite is classified as a form of spodumene, which is a pyroxene mineral with the formula LiAl(SiO3)2. 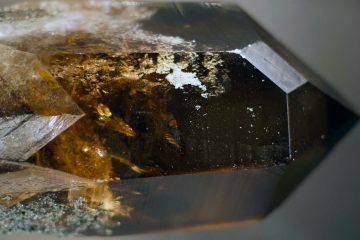 There are actually a number of different types of spodumene, all classified according to their color. Spodumene may occur in yellow, yellowish-green, deep emerald, pink, purple, or colorless varieties. 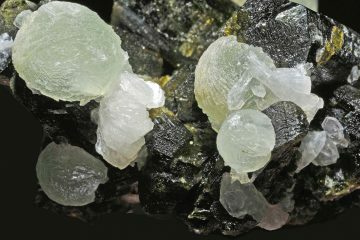 The deep green spodumene is known as “hiddenite”. 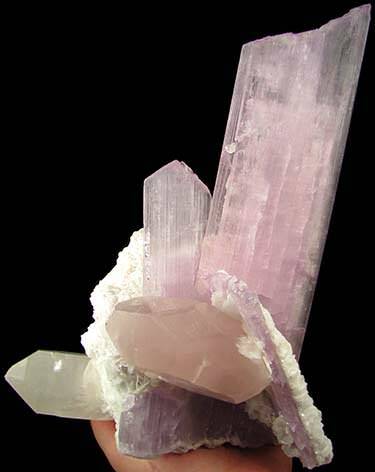 The pink or purplish spodumene is called “kunzite”. Kunzite does not have to showcase a deep hue in order to be classified as such; many pieces of kunzite are very pale, almost colorless. 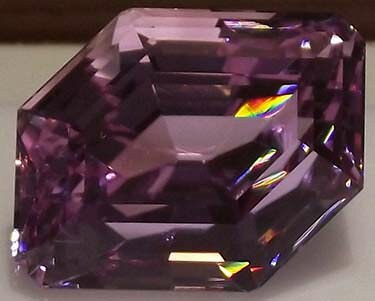 It is in fact quite common for the color of kunzite to fade over time. This is usually the result of too much exposure to light. While this process is gradual, it is so pronounced that many people who own kunzite jewelry avoid wearing it during the daytime. For that reason it is strongly associated with evening wear. Note however that if you see something called “rose kunzite” for sale, it probably is not kunzite at all. This is actually a common and misleading trade name for synthetic pink sapphire. Kunzite may also exhibit pleochroism. This means that it can actually present more than one color at a time, especially when viewed from different angles. You might for example find a piece of kunzite with both lilac and pink hues. Or you might find one with lilac and green hues. In terms of texture and opacity, kunzite usually is quite glassy and smooth. It may be streaked with white or have a pearly look around the cleavage. It is quite brittle and has a tendency to fracture. It ranks a 6.5-7 on the Mohs scale of hardness, but still must be handled with care because of the strong cleavage. It is very easy to break kunzite. For this reason it is also tricky to cut. Re-cutting it can be even harder. In terms of industry, gemstone-quality kunzite is used for jewelry, and may be collected in its raw form. But lower-quality specimens of spodumene may be used as a source for harvesting lithium. This substance is then used in a variety of applications, including ceramics, automotive batteries, mobile technology, and medications. 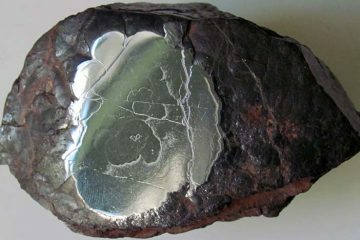 The lithium is drawn out of the spodumene by fusing it in acid. Lithium production from spodumene each year results in around 80,000 metric tons. There are other sources of lithium, for example alkaline brine lakes in China, Argentina, and Chili. But the lithium these sources produce is not as pure as that which comes from spodumene. So spodumene remains the best source. If you are shopping for kunzite, it is helpful to know that there are a few similar-looking gemstones on the market. Kunzite is sometimes confused with rose quartz, morganite, pink tourmaline, topaz, pink spinel, and imitation sapphire. We will delve into each of these in greater detail near the end of our guide. One of the best things about kunzite is the fact that it is not too expensive compared to a lot of other gemstones. As you would likely expect, the colorless kunzite is the least expensive, while the deeper hues of pink and lilac are prized the most. Note that many kunzite specimens are irradiated and heat-treated to enhance their natural color. Purists may protest, but most buyers do not care one way or the other about whether their kunzite gems have been heat-treated or not. Why? Well, for one thing, it would be impossible to detect if it ever happened, so you basically have to assume that most specimens you see for sale probably were treated. For another, kunzite is a stone with an appearance that is likely to change over time anyway, even if you are taking great care of it. Even if you did have a stone which you picked up from the ground yourself, and you knew no one had treated it, it is not as if you would be picking up the stone in its “original” color. Kunzite changes a great deal in nature too. This is why heat-treatments and irradiation often go unreported by kunzite sellers. You shouldn’t worry about them unless you are a purist; they have no significant impact on the value of the gemstone. Size does not usually have a huge impact on value for the simple reason that it is quite common to find large chunks of gem-quality kunzite. One piece housed in the Smithsonian weighs 880 carats! 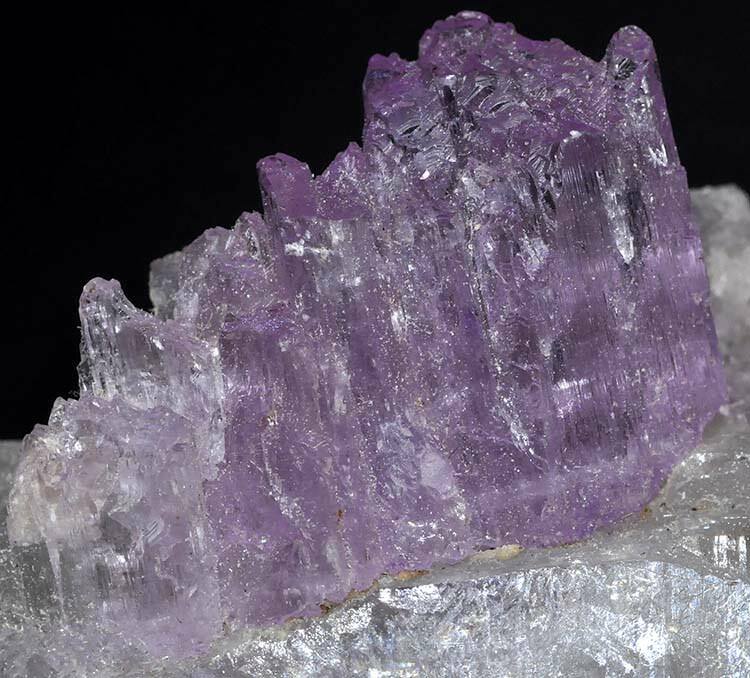 Kunzite can be made into earrings, pendants, necklaces, bracelets, and more. The gem is rarely tumbled and polished, since this does not exhibit its texture, clarity, or color to the best effect. Typically, kunzite is faceted for use in jewelry, though you will sometimes also find it in its raw form. Since the raw form has that lovely glassy smooth texture, it can be quite stunning when placed in a beautiful setting. Kunzite is ideally suited for faceting, however, because it exhibits an amazing amount of clarity and sparkle. Many pieces have only a few inclusions. Sometimes kunzite does feature inclusions, but they are often aesthetically pleasing (i.e. needle inclusions) and can be worked into the finished gem so that they contribute to its beauty. Gem cutters must be extra careful while working on it so as not to break it along its cleavage. Setting the gem is also delicate work. On rare occasions, gem cutters may even attempt to carve the gem, but this is quite tricky. While kunzite is sometimes made into earrings and rings, it is usually used as a pendant stone instead. Why? Because kunzite breaks so easily during cutting, it is hard to successfully facet small kunzite gemstones. It is much easier to work on a larger piece without it fracturing. You can find kunzite engagement rings, despite the delicacy of this gemstone. Is purchasing one advisable? Well, it is totally up to you, but generally speaking, I would say this is not the best choice. Here are the pros and cons. Kunzite is a beautiful gemstone with a lovely color. Because it comes in warmer and cooler shades, it can suit any skin tone. Because kunzite is rarely used in engagement rings, if you have one, it will be a great conversation piece. 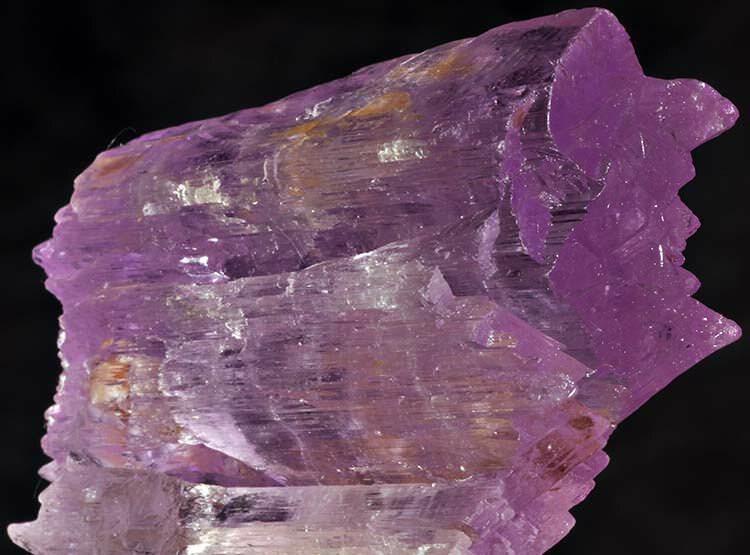 Kunzite’s cleavage and brittle structure make it susceptible to breakage. As a result, it is not a very durable stone for daily wear. Plus, if you need it re-cut, you probably will find yourself at a dead-end. Re-cutting such a small stone would be very challenging, and it might very well shatter. Kunzite does not have a high monetary value. 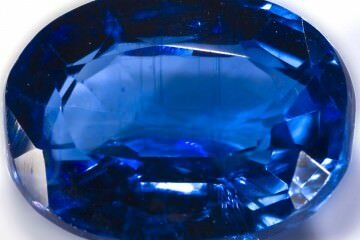 It is a very common gemstone, and as a result, it is not very expensive. This may not make a great statement unless your recipient knows you are shopping on a budget. Kunzite’s color fades much faster than you might expect. As a result, wearing it day in and day out every day could result in the color going quite quickly. A kunzite ring which exhibits a rich lilac hue now may be quite pale in color years down the road. For these reasons, I would assert that kunzite makes a lovely gemstone for evening wear, but it is not a great choice for wearing around the clock as an engagement ring. Cleaning Kunzite isn’t easy. You should never use a steam cleaner or ultrasonic cleaner, because it is way too easy to break the gem. You should only ever wash it by hand using warm, soapy water (avoid harsh detergents). If you need to scrub it, then do so using an old, soft toothbrush. Storing Kunzite requires care as well. You need to keep it away from sources of heat or light. So put it in a cool, dry, dark place. Never leave it lying around in the open for any length of time. Keep it inside a soft pouch or even its own little jewelry box. That way it will rub against other jewelry. It is just way too easy for it to break. If you are traveling with it, definitely keep it inside a hard case to absorb impact and cushion it from blows in case you drop your luggage. The history of kunzite dates back over millions of years, but the gemstone was not identified and named until relatively recently. It was in 1902 that George Frederick Kunz, a New York gemologist, described the stone in detail. The kunzite which Kunz was analyzing was unearthed in California. As you have probably figured out, the gemstone was named after Kunz since he discovered it. Hiddenite, the green species of spodumene, was likewise named for W. E. Hidden, the gemologist who discovered it. 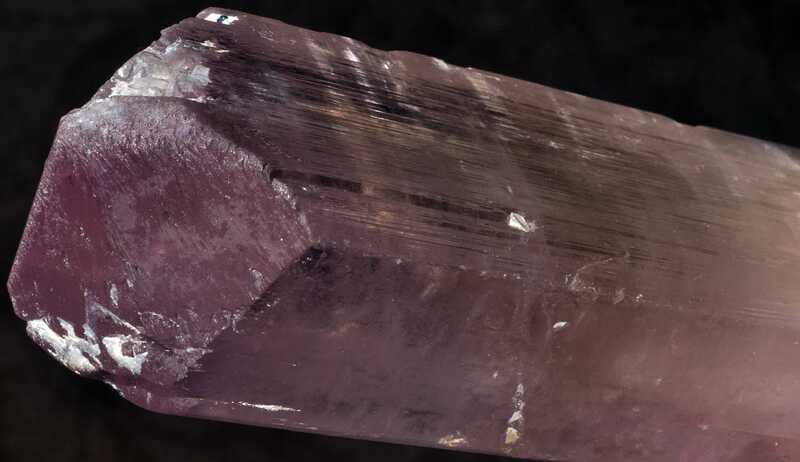 While the original piece of kunzite was discovered in San Diego County, most kunzite now unearthed comes from Brazil, Madagascar, Afghanistan, Pakistan, and Quebec, Canada. Kunzite stones are still discovered in California and North Carolina as well. Because kunzite was not identified until 1902, it is hard to say much about the history of the gemstone before that time. If it was discovered and used, it was not identified, nor is there any significant record of archaeological finds with kunzite. 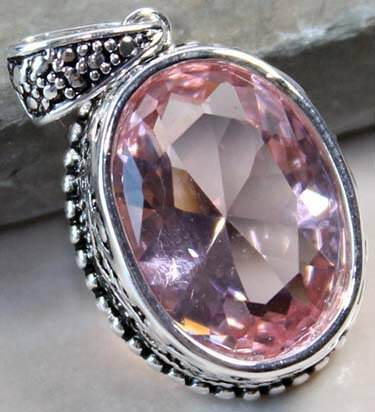 Because of its rosy pink color, kunzite is typically associated with the heart chakra, and thus with emotions. It is considered a very soothing, centering stone, one which helps to open up the heart and kindle compassion and positive thinking. It is widely linked to healing and is often used to quell anxiety and panic attacks, and overcome trauma. It can be good for deflecting criticism from others. Sometimes kunzite is also associated with friendship and romantic love. Overall, it is a stone of serenity. A spectacular, 85-carat kunzite gemstone from Afghanistan is discussed by Edward Boehm from the Gemological Institute of America (GIA). There are a number of gemstones which have a similar appearance to kunzite and which you may mistake for kunzite. Rose quartz: Rose quartz, unlike kunzite, is typically cloudy in appearance, not clear and free of inclusions. Quartz also has a very specific texture which you can learn to recognize if you have seen and held enough of it. Rose quartz is typically a warmer color than kunzite as well. 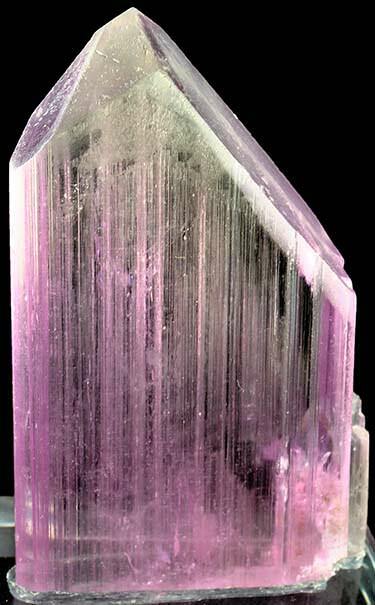 Kunzite may be closer to lilac on the spectrum, whereas rose quartz is usually closer to a true pink. Pink topaz: Pink topaz is significantly harder than kunzite. On the Mohs scale of hardness, topaz rates an 8. Pink topaz is typically a much deeper, bolder, more vivid pink as well. 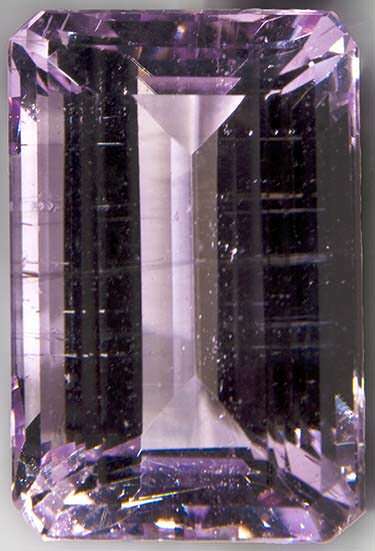 It may range toward the same lilac hue which is common with kunzite however, and may likewise be clear and relatively free of inclusions. For that reason, sometimes it is hard to tell apart from kunzite. Morganite: Morganite is usually easy to tell apart from kunzite because it tends to be a much warmer pink in color, almost rose gold. But other times, morganite may be lilac-colored, which makes it hard to distinguish from kunzite. Even lilac-colored morganite often has a hint of warmth to its hue however, and on the Mohs scale of hardness, it rates a 7.5 or 8. Pink tourmaline: Like pink topaz, most pink tourmaline is deep, bold, and rich in color. 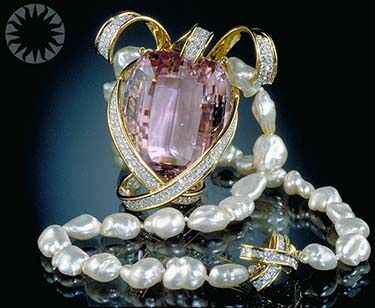 Most of the time it is a true pink, and warmer on the spectrum than the cool pink or lilac of kunzite. Pink spinel: Pink spinel is harder than kunzite, measuring an 8 on the Mohs scale. In terms of color, it can range quite a bit. It may be a deep, bold pink, or it can be a lighter pink or lilac color. This makes it hard to tell apart from kunzite on a visual examination. Synthetic pink sapphire: Sometimes you will see a product for sale marketed as “rose kunzite.” It might also be called “pink sapphire.” This may sometimes actually be pink sapphire (which might sometimes also be classified as ruby), or it might refer to an entirely synthetic product. Either way, it usually isn’t kunzite. This is especially confusing because kunzite can be rosy in color, and is relatively inexpensive. So it is hard to see why there are synthetic kunzite gemstones on the market at all. One likely explanation might be that these synthetic stones would be able to retain their color instead of fading over time with exposure to sunlight. Thankfully the fact that kunzite is common and relatively inexpensive means that you will rarely see more expensive gemstones passed off as kunzite. Usually if you see a stone marketed as kunzite, that is exactly what it is. Sometimes however while shopping for spinel or topaz, you may see kunzite posing as an imitation. Now you know all about kunzite. It may not be the most well-known gemstone out there, but it is a beautiful and unique one and a wonderful acquisition for any collection!